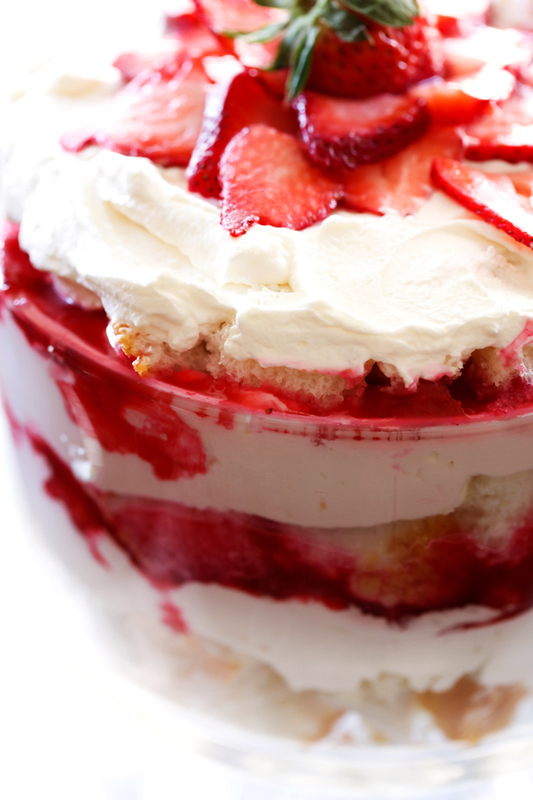 A light and delicious trifle layered with strawberry sauce, angel food cake and whipped cream! This will be a hit wherever it is served! Today is technically the first day of SPRING! I am ecstatic! I love spring and it is always so relieving, at least for me, to say goodbye to winter. Although, the weather doesn’t always know that the calendar has declared it springtime haha! 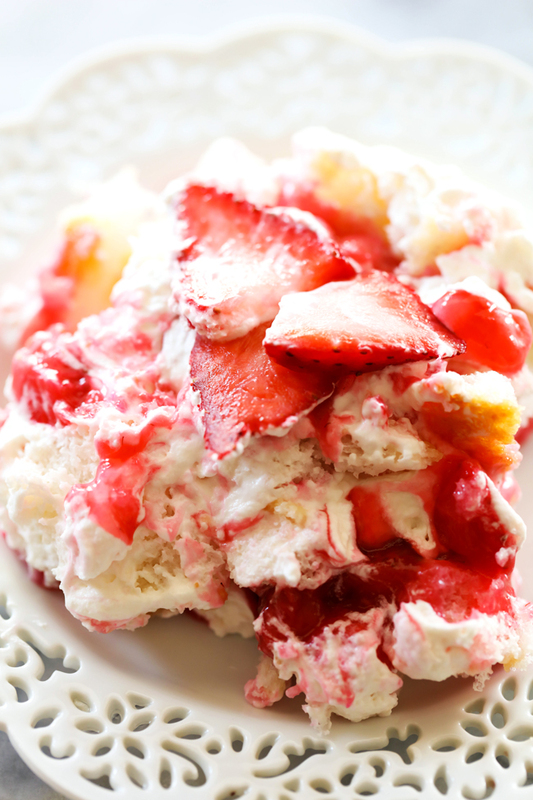 This Strawberry Shortcake Trifle is PERFECT for the upcoming warmer weather! It is very light and fresh. We served this at a family get together and people couldn’t keep there hands off it! It has layers of homemade strawberry sauce, whipped cream and angel food cake. The combination of ingredients and flavors fuse together to create and unforgettable and unbelievably delectable bite each and every time! If you are looking for that perfect treat to serve, give this one a try! It is sure to be a hit! In a small bowl, combine corn starch and cold water. Stir and set aside. In a medium sauce pan over medium high heat, combine strawberries, sugar, water and lemon juice. Bring to boil. Reduce heat to low and stir in corn starch water. Cook for 2 minutes, stirring constantly, until mixture thickens. Remove from heat and cool completely. In a large mixing bowl, beat heavy cream. Slowly add in ¾ cup sugar. Beat in vanilla and continue beating until soft-medium peaks are formed. Place ⅓ of the angel food cake on the bottom of a trifle dish. Spread ⅓ of the whip cream over the cake. Spread ⅓ of the strawberry sauce over the whip cream. Repeat the process 2 more times. This sounds great! Indeed perfect for the enhancing weather and for Easter. So pretty! And, it looks delicious! Pinning to Pinterest! Not sure how much sugar to put in whip cream? I made this and it turned out delicious but I will be doubling the strawberries and sauce next time! Hi. How much water in the syrup? I added a thin layer of custard (because trifle! ), and a drizzle of homemade strawberry merlot coulis. I think it's gonna be a hit! I made this and it's now my families favorite! Thank you.